The final report by Special Prosecutor Robert Mueller is in and it’s as much of a vindication for President Trump, his family and his campaign staff as could be hoped for. The fact that the President and everyone on his campaign were found to not have been guilty of collusion with Russian (or anyone else) and found to not be guilty of obstruction of justice comes as a huge surprise to many CNN and MSNBC viewers in this country. President Trump and to a lesser degree the Republicans in Congress have gotten more done, more victories than could have been imagined given the unprecedented opposition he has faced. While he continues to frequently stick his foot in his mouth with his boorish and at times childish Tweets, he continues to get the work done of the American people. He continues to strive for exactly what he was elected to do. Since the day of his election in November 2016 the left has talked about impeaching this President. Since they didn’t have any actual proof of “high crimes and misdemeanors” they literally manufactured lies about Trump’s personal behavior and of his campaign’s colluding with a known hostile party. Russian and/or the Soviet Union have been trying to undermine democracy in the U.S. and elsewhere in the world for decades. They’ve been involving themselves in Presidential elections as best they could since the days of Nikita Khrushchev. Investigators claim Russians spent $400,000 (that’s 400-hundred thousand) on Social Media ads to sew disunion in the U.S. during the 2016 election cycle. If true, so what? 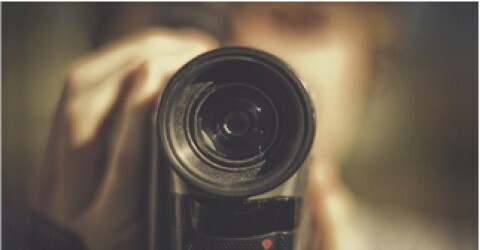 $400k is a paltry and largely ineffective amount to spend on marketing. I know. I’m a marketing expert. Additionally, much of what was advertised wasn’t in support of Trump. Almost none of it was. Much of it was in support of Bernie Sanders, the admitted Socialist. While falsely claiming that Trump was in bed with Russians, the collusion story is far from the only lie CNN, MSNBC, the New York Times and other leftist, Socialist media organizations and Democrats have spread about Trump. Here’s one: Trump called neo-nazi’s and white supremacists “fine people”. That lie has Trump labelled a racist. The problem is…he never did say it. He never called the bigots at the Charlottesville, VA rally anything but deplorable people, who shouldn’t be tolerated and who have no place in the United States. So? What to do now? They only way this news of the lies and manipulation of American society can have any benefit is if enough people who hate Trump, and oppose the Conservative agenda he work’s toward finally admit that they were wrong and that they see their media and political leaders as the liars and the hypocrites that they so evidently are. Enough people must reject watching and listening to MSNBC, CNN, NBC News and reading the New York Times, Washington Post and other leftist propaganda venues. These organizations stopped being journalistic a long time ago. Rather than simply leaning their reporting toward their leftist tendencies and beliefs; these supposed news organizations have become advocates for everything we as a society used to collectively recognize as bad, evil or at least destructive. They must vote out of office the Adam Schiffs, the Nancy Pelosis, the Chuck Schumers, the AOC’s. They must recognize and embrace Making America Great Again. I’m not holding my breath. I think the fight continues and probably gets more desperate. Please share this blog if you agree. And please comment whether you agree or not. We welcome your thoughts. I am once again faced with the sadness of reading about a famous person’s depression and suicide. Like so many others I woke this morning to read of and hear about the tragic death in Paris, France of Chef and CNN show host Anthony Bourdain. I watched his show maybe once, ever. But knew of him through interviews and commercials. Its not my knowledge of his death that saddens me. Its the suicide. Along with the death earlier this week of fashion designer Kate Spady we are all reminded of how fame, fortune, and accomplishment are not enough to fend off the terrible grips depression can have on people. It’s power can feel overwhelming. And it can take lives leaving behind a wake of incomprehensible grief for those who knew the deceased. As in the examples of Anthony Bourdain, Kate Spady, Tyler Hilinski in January, and Robin Williams a few years ago; one doesn’t need to personally know someone to be effected. I have never attempted suicide. I have thought about it. The betrayal of my ex-wife and the associated circumstances that lead to our divorce after 28 years of marriage caused me to fall into an almost deadly depression. For nearly 2 years I struggled to make it through each day. I cried every day. It got so bad that crying become a necessary comfort. I remember times when if it got late in the day and I realized I hadn’t cried that day, I would make myself cry because I felt I had to cry to feel normal. The will to continue living is weakened in such circumstances. The will to end it and stop the pain grows. Obviously for some ending it all becomes the solution they see as their only option. I felt that way, way to often. It’s frightening to think back on those times now. If I could say anything to help those suffering from depression and suicidal thoughts it would be these two things. Not all people care about you. But some do. Some do very much. The other thing is that you can find salvation, literally, through God, the Lord Jesus Christ. When I discovered my ex-wife’s cheating and she confessed it and then all the lies and false and incomplete stories came to light I knew right away I would need help. I knew the feelings in me were too strong and too destructive to try and cope on my own. After meeting with and rejecting several counselors and counseling services I turned to my church. My church provided a counseling service I had previously never known about. It provided me a new friend and sound wisdom in the face of irresponsibility and illogical behavior I was faced with every day. I prayed every day. I read the Bible. I read lots of books. Most of the books I read were self-help books or biographies of successful people I admired. Not surprisingly I kept finding in these books a recurring theme. God was at the center of many people’s success. So, while I always felt I led a good life and believed in Christ; I made a more deliberate effort to pray, read the Bible and eliminate from my character and my behaviors things that were in conflict with God’s teachings. I am also not ashamed to admit reading the Bible and studying it taught me how to accomplish so much more in life and in my relationships. While I had led a good life. I was still doing much wrong, that I didn’t realize. I’ve done much better since. I will continue to improve. The other thing about depression is that friends and family tire of your depressed state. Initially you can find all the support you can handle. Everyone has a sympathetic ear and kind words of wisdom and support. But as your depression lingers or if it goes away and returns many of these same people ostracize you. They stay away. They no longer want to be part of your problems. You have worn them out. It’s easy to understand, to a point. Nobody wants to be around a sad person all the time. This sad or depressed person can bring you down and effect your own life. But, there is a difference between a negative person who is always grumbling and having a glass is half-empty view on life versus someone who is depressed. If you are the friend or family member of someone who is depressed, I urge you to hang in there. Don’t turn away from them. And realize you can positively change their life for the better. The perpetually negative half-empty glass type of person is someone you want to avoid. But the depressed person can be helped. If you were there for them at the start of their depression. Be there at the end. You and they will reap the rewards of a closer relationship in the future. I lost friends and family through my depression. They are gone now and probably don’t care that I have rebounded and am a happy person again. I have found love. And while I now know that falling back into the spiral of depression is something I am susceptible to doing, I am wiser for having come through it and can fend it off on the occasions when it creeps back into my conscious. So help those that you can. Share God’s word. And if you are suffering yourself be proactive in combatting your depression. Take steps. The pain can go away and happiness can be your end story. 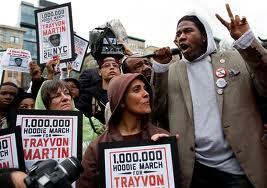 Trayvon Martin’s Killer Should be Punished, Right? Let me start out this blog by making perfectly clear I think the killer of 17-year-old Trayvon Martin should be criminally charged and face prosecution for the death of the Florida youth. I have no desire to put my head in the lions mouth on this subject. Clearly the mob …errrr…people have made clear their hope for justice in this case. When I first heard about this I was as concerned as anyone. Imagine a man following a small skinny kid home in a rich neighborhood confronting him and shooting him for no reason, no reason whatsoever. Sounds pretty unbelievable doesn’t it? Well, as I said I just hope that the killer gets what’s coming to him. It wasn’t until later that I learned that the killer George Zimmerman was an ethnic minority too, just like poor innocent, young Trayvon. Still…Zimmerman should be in jail. The fact that Zimmerman was selflessly patrolling the streets of his neighborhood as a community neighborhood watchman is unimportant. He clearly is a racist for shooting harmless little Trayvon. And when I learned that there had been numerous home burglaries in this gated community where Trayvon was shot, I thought, well that explains the need for a neighborhood watch. But it doesn’t explain shooting a poor innocent child who has never, ever done anything wrong. Why would Zimmerman follow this kid who was innocently walking home from the local grocery wearing a hoody, concealing his appearance? It was his neighborhood, wasn’t it? So I thought. Turns out Martin was not known in the neighborhood. He was staying at his a relatives while he served out a 10 day suspension from his high school for drug possession. Still, to shoot him? And the fact that following someone, anyone, is not actually against the law shouldn’t be considered. I still think the racist Zimmerman needs to hang. And though the media is clearly trying to steer the emotions of the story by repeatedly showing pictures of a much younger Trayvon, with skinny little arms who couldn’t hurt anyone rather than the older, muscular, tattooed Trayvon doesn’t change the fact that Zimmerman hunted down this kid because he was black and killed him. Zimmerman needs to fry! When police showed up at the scene of the murder February 26th they found a bloodied Zimmerman. He had blood coming from his nose, where he says Martin punched him. And he had blood on the back of his head from Martin slamming his head against the concrete. As CNN reported the fact that Zimmerman wasn’t even following poor Trayvon at the time of the confrontation doesn’t change the fact that Zimmerman hatefully and wrongfully shot Martin for no reason at all other than he’s black. Zimmerman told police he was following Martin because Martin looked suspicious, but that Martin ran from him and got away. He says he didn’t know where Martin was when he was walking back to his car. He says at that time Martin emerged, approached Zimmerman and confronted him asking “You got a problem?”, to which Zimmerman said “No”. Then according to this evil racist killer Martin said, “You do now” and punched Zimmerman in the nose, knocking Zimmerman to the ground where poor innocent Trayvon pounced on him and continued hitting him and pounding his head into the concrete. Zimmerman claims to have called out for help, something audio witnesses claim to be true. Still, Trayvon is dead and there is no good reason for it. 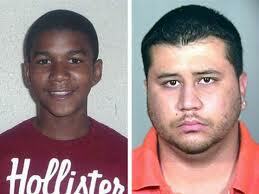 According to the CNN report police in Sanford, Florida wanted Zimmerman charged with Manslaughter, not murder. Manslaughter, for shooting an innocent 17-year-old old boy who did nothing wrong but jump and beat up a guy who was following him in a neighborhood where he didn’t live and where there had been recent criminal activity. Like I said. There is no justice. Zimmerman must be a racist. How could he not be. He shot poor little, innocent Trayvon. I think he should go to jail.